Dive In Deep is Bard of Ely's second album on DMMG Records. 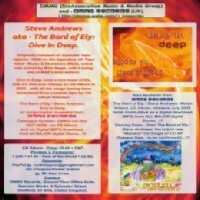 It is a remastered and re-released collection of songs that were originally released as a cassette album on M & E.
Steve Andrews/Bard of Ely's Dive in Deep was a best-selling album on Mick Magic's legendary Music & Elsewhere label back in 1992 when it was released on cassette. Now it has been remastered for CD re-release by Alan Craw and it is available again on his DMMG Records. Dive in Deep follows Bard of Ely's album Welsh Wizard as his second album of original songs released on DMMG. It is now also available for download from iTunes and all major download stores worldwide. There are 17 songs on Dive in Deep,all of which are written by the Bard of Ely except for the track entitled UFO Song which is actually a live version of the traditional song What Shall We Do With A Drunken Sailor? performed with the aid of the Bard's famous "Mothership" and recorded at a gig at the Chapter Arts Centre in Cardiff. The Mothership is actually a toy flying saucer with a microphone attachment through which the Bard of Ely sings. Other tracks include, Superhero, Jungle Love, Reality Song, Kingfisher, Raga Rock, Peter, Insect Inside and Always Look So Fine. Real Love and Communication, on which the short-lived band Flowers of the City backed Bard of Ely, has recently received some airplay by Welsh DJ Les Paul. It is a ska-style song with simple but effective lyrics and an infectious chorus. The song is also included on the Welsh Wizard album. Dive in Deep is bookended by two versions of Superhero with the last of these being a live recording also recorded at Chapter Arts, as was the song Sheep . There is plenty of audience participation on the live recordings which help spice up the album and add to the variety of its musical content. The song Kingfisher has become one of the Bard's most popular songs and used to get played on the air by Steve Johnson on Red Dragon FM Radio. Bard of Ely was recently a guest on Steve's new show on Cardiff Radio and he played the song live. Singer-songwriter Pixi Morgan was so impressed by Kingfisher that he has incorporated the song into his own live sets as a cover version. Songs on the album are in psychedelic rock, folk rock and acoustic genres and the album gained many excellent reviews when it was released the first time around. When Dive in Deep was originally released on Mick Magic's cassette label for underground and unsigned bands it spent a lot of time at the top of the charts published in the Music & Elsewhere newsletter. The original cassette artwork was created by Janice Pugsley with psychedelic lettering by Glyn Kerry Groves but this time around it has brand new cover art by Orion Hale. 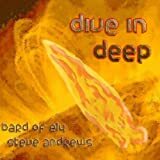 The songs on Dive in Deep represent some of Bard of Ely's best work as a singer-songwriter and he is thrilled to see that his work is available again, and this time on CD and via digital download on the Internet. What Shall We Do With A Flying Saucer? Ed Sheeran tattoos, facts, music, posters, shirts and more all the Ed Sheeran items and details any Ginger Jesus fan could want. Get your Ed Sheeran fix here. Joe Cocker gave a concert in Bucharest as part of his Fire It Up Summer Tour. This article includes concert setlist, photos, HD videos, some comments, and a short Joe Cocker bio.